Want to overcome your fears and speak confidently. Then this Public Speaking Workshop is for you ! Our Intermediate, upper-intermediate and advanced levels students are invited to come over on Thursdays of May 2018 ! 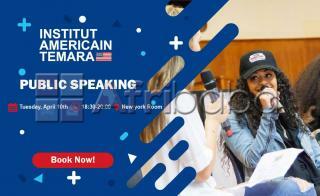 AMERICAN and Moroccan Teachers will be taking the lead and helping you the way through ! Food and drinks will be provided.